The Medici Fortress at the top of the hill above Cortona is worth a visit in it’s own right, if not just for spectacular views, you can see Il Pino with a good camera lens on a clear day. 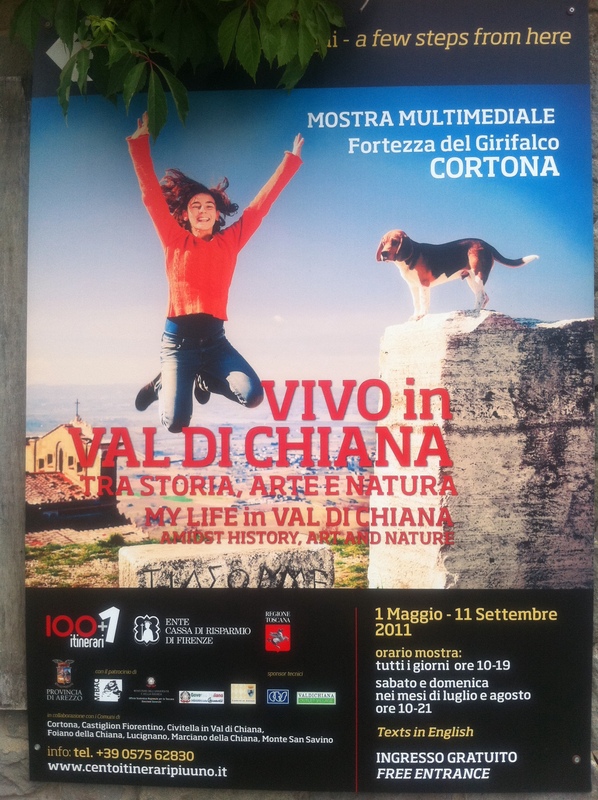 They also have art and other exhibitions on, this year they have installed a multimedia exhibition on life in the Val di Chiana, which is worth dropping in to see. There are lots of old photos from the last century of the local way of life juxtaposed with photos of modern life in the valley with the same communities, fascinating to see how much and how little has changed and you don’t need to speak Italian to understand or appreciate it. There are some excellent historical itineraries of art and castles and fortresses in the valley which are up on display alongside short films which give you an idea of the little known treasures to be found in the area around Il Pino. For a forecast that’s more accurate than most try http://www.ilmeteo.it, type in Toscana for the region, Arezzo for the provincia and Cortona for the comune/localitá. It will give you seven days.